Brown made strides in the 2013 year. She scored a career-high 18 goals, setting a new team record after her 15 goals last year. She scored 14 of those in the last seven games, including a five-goal game against Waterloo on Oct. 4, setting a new team record for goals in a single game. 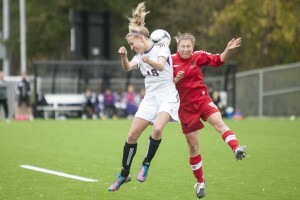 She helped lead the Hawks to an OUA championship banner and a berth at nationals. Brown was named an OUA first-team all-star, the OUA West MVP and a CIS first-team all-Canadian. Winning one OUA championship in your first year is something special. Winning two in your first year is unheard of. Normandeau took home two OUA championships playing for the Laurier women’s soccer and hockey teams. She became the first Laurier athlete to win two OUA championships in the same year. She was an integral part of the solid back four for women’s soccer and had no penalty minutes with women’s hockey. Campbell put up impressive numbers a year after being buried in the depth charts. He went from merely 85 rushing yards in 2012 to 867 rushing yards in 2013, good enough for first in the province and fourth in the country. He tallied up six touchdowns — five rushing and one receiving, compared to one total in his first two years, and scored a 100-yard touchdown against the Western Mustangs. Styles finished off her final year in style picking up an OUA championship and a career-high 21 points, good enough for second in the country for defencemen. She put forward seven goals and 14 assists and only 18 penalty minutes, and helped lead Laurier to their first-place finish in the OUA before a fourth-place finish in the country. Mathers was integral in the performances from the Hawks this year. She was named an OUA second-team all-star after winning the OUA championship and helped carry her team to a third-place finish at nationals. Mathers became a strong rock for a young team, consistently putting up impressive shots and giving a word of encouragement. For someone who spent the majority of her year on the bench, Ellenor came out with a statement in the playoffs. In six playoff games, she matched her numbers from the season, finishing with 80 points in 11 games and was consistently the strongest offence women’s basketball had with 82 points. Ellenor hit double digits for the last four games of the season, including 21 points in the bronze medal double overtime win against Carleton. It was evident with a new coach and a new offence that men’s football was going to have issues. But after watching the team suffer week after week despite some impressive offensive spurts, the biggest upset comes from only one win at the helm of men’s football. Laurier was able to gain some ground against tough teams such as Western, Queen’s and Windsor, but could never finish their offensive strides. Their only win came against Waterloo, finishing the season 1-7. A year after being suspended for four games after an alleged hazing incident, the men’s baseball team bounced back to win their first OUA championship in school history. 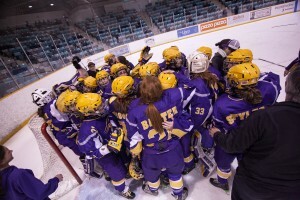 The team made formidable improvements in their overall playing to become a force in the OUA and went on to finish second at the inaugural OUA/OCAA championship a week later — all just a mere year after a major scandal. Eight rookies rounded out the roster that, for the first time since Rick Osborne was behind the bench, didn’t finish first in the OUA. The Hawks put on a defensive clinic in the OUA final against Queen’s to win the title and move on to nationals. But a young team couldn’t compete against the McGill Martlets or the Saskatchewan Huskies, as they settled for fourth in the country. You can’t help but watch as the women’s basketball team takes the court. Their charisma as a group captivates fans and makes every game interesting to watch, not to mention the countless amount of close games they managed to win en route to an OUA bronze medal. The girls also managed to get a fan bus to go to Windsor for the OUA West final, and even when they didn’t win, they always kept it interesting. When key players fell to injury early in the season, it looked to hurt the women’s basketball team’s chances of contending for a spot at nationals this past season. However, Falco was able to get amazing performances from a short bench and lead this team to countless close victories and a berth at nationals. Without a real prominent offensive player, Falco made what he had work well for a successful season.